Having over 25 years in the strata industry StrataMax is committed to assisting clients throughout the lifecycle of their business. Each stage has its own unique requirements and challenges and StrataMax is here to help. StrataMax is the perfect software solution for start-up businesses. This will set the foundation for scalable growth from day one without requiring bolt-ons along the way. The convenient model of per lot pricing with no minimums make this solution a compelling commercial choice. When starting a business you need to feel confident that you are building the best foundation for business growth and ultimately business success. In the growth phase Principals are focussed on controlling costs while at the same time presenting a compelling value proposition for clients. With the right foundation this stage is where the processes and automation are trialed and business-specific processes created. High value client facing features such as the online portal, customer web pages, online invoice approval and automated status reports are typically introduced. While not a phase that all businesses go through, buying a strata portfolio or strata roll can be quite strategic for growth. Acquisition is recognised as the fastest way to grow and for economies of scale can be quite compelling if the fit is right. It can also be an advantage if a business is needing to hire extra staff, move office or change business structure. Such changes can be costly. The right acquisition though can springboard this process while remaining profitable and still leave room for organic growth. StrataMax will actively work with business to identify and facilitate an acquisition. Please refer to the section on Buying a Portfolio for more information on acquisitions. This phase requires businesses to look at improving profits and value through efficiency gains. Staff roles and systems may need tweaking or in some cases re-engineering best-practice strategies to ensure your business is taking advantage of the software you are using. Our National Strata Business Consultant is able to assist and guide the business to utilise best practice and all opportunities for efficiency gains while using the software. 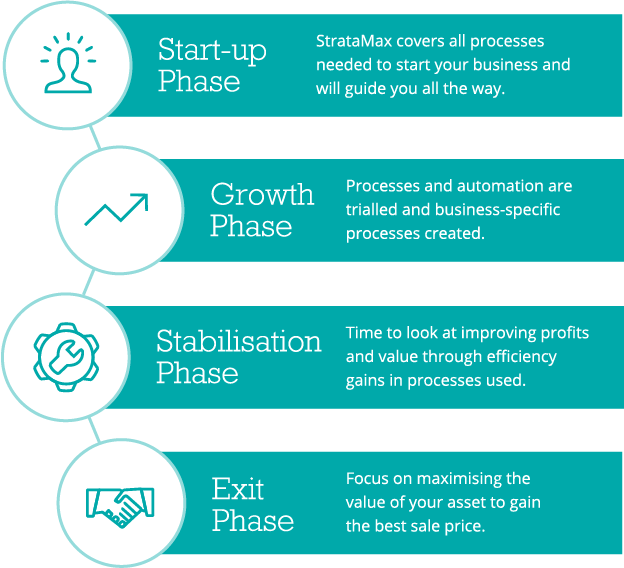 As you approach the exit phase you would be focussing your attention on maximising the value of your asset to gain the best sale price possible. You may need to determine the best method of actually determining how much your portfolio is worth. As Principal, when selling your strata portfolio, you may transition to a General Manager, or offer a management / partner buyout. During the exit phase StrataMax can assist with either an in-house transition or finding the right buyer. With a large number of keen buyers as clients, StrataMax is able to provide a confidential and anonymous means for sellers to explore their options before making the introduction. Please refer to our section on Selling a Strata Portfolio for more information.